Mouse anti Human CD321 antibody, clone F11 (MCA2270) used for the visualization of CD321 expression on microvascular endothelial cells in vitro by immunofluorescence. Immunocytochemical JAM-A tight junction staining in primary HBMEC is reduced under barrier-disturbing pro-inflammatory conditions. Cells were either left unstimulated or treated with TNF-α 10 ng/mL and IFN-γ 100 U/mL for 24 h.
Immunocytochemical staining was performed with primary antibodies against JAM-A (M.Ab.F11). Representative for 5 independent experiments with different HBMEC preparations. Bar = 25μm. Evaluation of Soluble Junctional Adhesion Molecule-A as a Biomarker of Human Brain Endothelial Barrier Breakdown. Mouse anti Human CD321 antibody, clone F11 (MCA2270) used for the evaluation of CD321 expression on microvascular endothelial cells in vitro by flow cytometry. 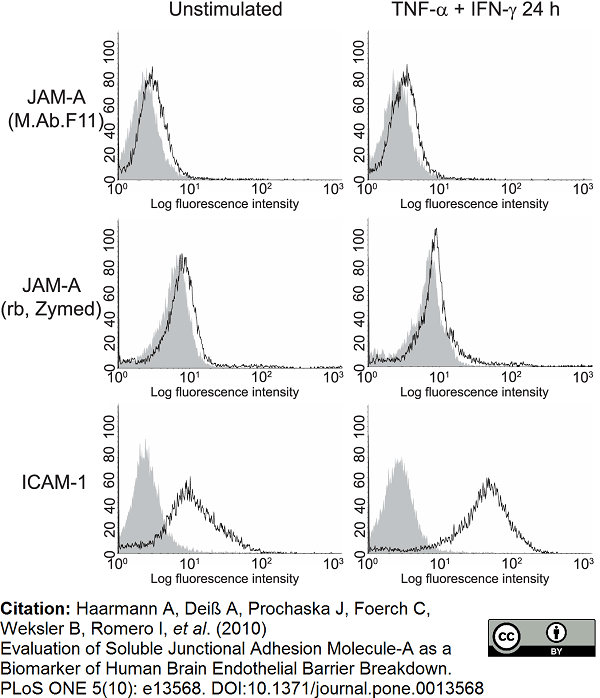 In contrast to ICAM-1, JAM-A overall surface expression levels on HBMEC do not change upon pro-inflammatory stimulation. Flow cytometric analysis of Accutase™-dissociated single cell suspensions of primary HBMEC after stimulation as in Figure 1. JAM-A was stained with M.Ab.F11 and a rabbit polyclonal antibody from Zymed. Staining against ICAM-1 served as a positive control. In parallel, unstimulated and stimulated HBMEC were stained with matched isotype control antibodies. Filled histograms represent isotype stainings, open histograms JAM-A and ICAM-1 stainings. Representative for 5 independent experiments with different HBMEC preparations. Mouse anti Human CD321 antibody, clone F11 (MCA2270) used for the evaluation of CD321 expression on microvascular endothelial cells in vitro by western blotting. Pro-inflammatory stimulation of HBMEC induces JAM-A dissociation from the actin cytoskeleton. A Primary HBMEC were either left unstimulated or treated with TNF-α 10 ng/mL or IFN-γ 100 IU/mL alone or in combination. Cell protein extracts were generated with a Nonidet-P40 based cell lysis buffer and subjected to Western blot analysis. JAM-A was stained with M.Ab.F11. Staining of the same, peroxidase-inactivated membranes with a rabbit antibody against β-actin served as a loading control. B N-deglycosylation of JAM-A with increasing concentrations of PNGase F for 2 h. A rabbit polyclonal antibody against JAM-A (Zymed) was used for the detection of JAM-A. The asterisk represents N-glycosylated, the open circle N-declycosylated JAM-A. Representative experiments out of at least 5 independent experiments with different EC preparations for each subpanel of the figure are shown. Mouse anti Human CD321 antibody, clone F11 recognises human Junctional adhesion molecule A, also known as CD321, JAM-1, JAM-A, Platelet F11 receptor, Platelet adhesion molecule 1 or PAM-1. CD321 is a 272 amino acid ~35 kDa single pass type 1 transmembrane glycoprotein expressed by endothelium, epithlial tissues and some leukocytes (Ostermann et al. 2002). CD321 was originally identified as the F11 receptor expressed on platelets (Kornecki et al. 1990). Mouse anti Human CD321 antibody, clone F11 is able to activate platelets, leading to aggregation and granule secretion (Kornecki et al. 1990, Naik et al. 1995). MCA2270 detects a band of approximately 35-40kDa in platelet cell lysates. Kornecki, E. et al. (1990) Activation of human platelets by a stimulatory monoclonal antibody. J Biol Chem. 265 (17): 10042-8. Sobocka, M.B. et al. (2000) Cloning of the human platelet F11 receptor: a cell adhesion molecule member of the immunoglobulin superfamily involved in platelet aggregation. Immenschuh, S. et al. (2009) Transcriptional induction of junctional adhesion molecule-C gene expression in activated T cells. J Leukoc Biol. 85 (5): 796-803. Fraemohs, L. et al. 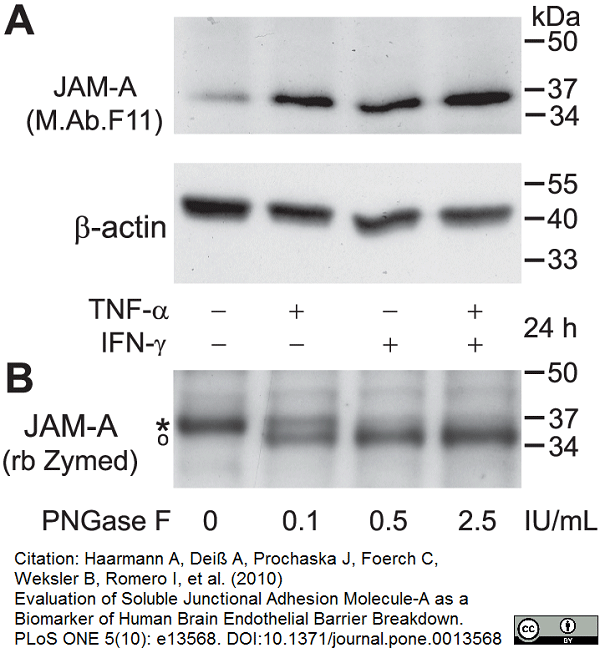 (2004) The functional interaction of the beta 2 integrin lymphocyte function-associated antigen-1 with junctional adhesion molecule-A is mediated by the I domain. J Immunol. 173 (10): 6259-64. Haarmann, A. et al. (2010) Evaluation of soluble junctional adhesion molecule-A as a biomarker of human brain endothelial barrier breakdown. PLoS One. 5 (10): e13568.